Welcome to the website of our South Africa Synod (of the United Congregational Church of Southern Africa). We feel blessed that you decided to visit this space. The SA Synod was started in 2002. The South Africa Synod has eleven regions across South Africa. Most regions are equivalent to a province e.g. KZN Region covers all of the KZN province or Central Region covers Gauteng and some part of Limpompo and Mpumalanga provinces. This website is a space intended to keep each other connected, updated, spiritually nourished and uplifted. We trust that you will be blessed as you browse through different menus and sub-menus that contain a variety of resourceful and enriching documents, networking tools and prayer-connections. Don’t forget to let us know how blessed you have been during your interaction with our website or share your suggestions with us. 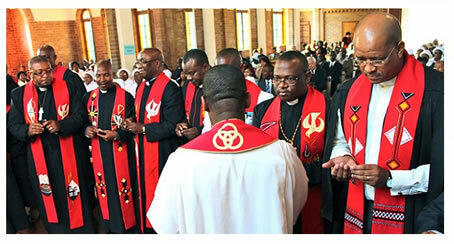 The SA Synod is one of five Synods that constitute the United Congregational Church of Southern Africa (UCCSA), that is, Botswana Synod, Mozambique Synod, Namibia Synod and Zimbabwe Synod. Although the UCCSA was only formed in 1967, it traces its origins back almost 200 years, to the arrival of the first personnel sent to the sub-continent by the London Missionary Society (now called Council for World Missions, CWM) and American Board of Commissioners for Foreign Missions (now called Global Ministries, GM).